In the same interview I mentioned in my previous entry, Ray Bradbury mentions that when he was young, he saw every movie that came out: “When I was seventeen,” he says, “I was seeing as many as twelve to fourteen movies a week.”Â That’s a lot of movies, including a lot that weren’t good, that is, that had weak plots, poor acting,Â flat characters, and so forth.Â “But that’s good,” Bradbury says. It’s a way of learning.Â You’ve got to learn how not to do things.Â Just seeing excellent films doesn’t educate you at all, because they’re mysterious.Â A great film is mysterious.Â There’s no way of solving it.Â Why does Citizen Kane work?Â Well, it just does.Â It’s brilliant on every level, and there’s no way of putting your finger on any one thing that’s right.Â It’s just all right.Â But a bad film is immediately evident, and it can teach you more: “I’ll never do that, and I’ll never do that, and I’ll never do that” (Zen in the Art of Writing, p. 128). I read this paragraph a week ago, and I’ve been turning it over in my mind from time to time ever since.Â There’s a lot of truth to what Bradbury says here, I think.Â Bad art (by which he and I mean poorly crafted art, not wicked art) can help you learn things that great art can’t, namely, what not to do.Â But I suspect that it teaches that lesson only to those who love great art; the rest don’t recognize the mistakes in bad art as mistakes and end up emulating them.Â Bad art teaches, it seems to me, only if you approach it in the right way. Still, I think there’s more to be said, and so I invite you to interact with Bradbury on this point and to sharpen my own thinking. Everything.Â The main thing is compression.Â It isn’t really cutting so much as learning metaphor â€” and this is where my knowledge of poetry has been such a help to me.Â There’s a relationship between the great poems of the world and the great screenplays: they both deal in compact images.Â If you can find the right metaphor, the right image, and put it in a scene, it can replace four pages of dialogue (Zen in the Art of Writing, p. 127). Bradbury goes on to talk about a particular scene in Lawrence of Arabia, but what immediately came to my mind was a scene in Kristof Kieslowski’s Red, which would take a lot longer to describe here than it takes to show.Â Â The entire scene is this: the camera shows the girl, who is one of theÂ main characters, having fun bowling withÂ some friends, and then swings over a few lanes toÂ linger for only a moment or two on a table at a bowling alley.Â On the table is a cracked beer glass, an ashtray full of cigarettes, and a crumpled Marlboro package. That’s it.Â That’s the entire scene.Â It means nothing to you, dear reader, because you didn’t see what led up to it.Â But if you had watched the movie carefully up to this point, you would have understood immediately. Getting back to Bradbury’s point, what you would have understood from those few seconds would have taken a lesser director and writer many minutes of dialogue and action to convey to you.Â Kieslowski does it in one image. That’s one of the glories of film as a medium.Â As Bradbury says, metaphor comes close to accomplishing the same thing in poetry and prose.Â But only in film can you use sound, music, lighting, images, and so forth to get across what would take hundreds of words to explain. Last night, in lieu of our usual Bible study, we watched Chocolat. 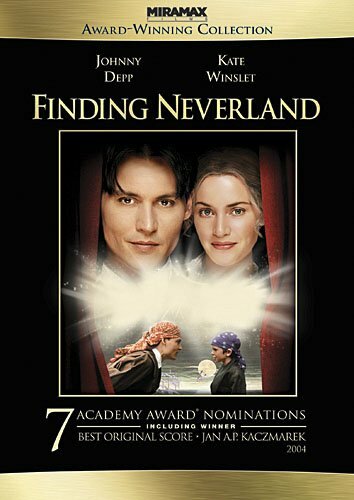 I had loaned our copy to a friend during Lent, which is the perfect time to watch the movie since that’s the setting of the story, and when he returned it I thought it would be good to watch with the congregation. There are spoilers in what follows, so if you haven’t seen the movie and you might want to, stop reading right now. Neopaganism can be seen as the driving force behind the Oscar-nominated Chocolat (2001), written by Robert Nelson Jacobs from Joanne Harris’s novel. In this clever version of neopagan redemption, an entire French town is oppressed by the moral scruples of a patriarchal Roman Catholic mayor. The town is then scandalized by the arrival of a mysterious single mother, who rejects the mayor’s “conventional” religion in favor of her Mayan mother’s pagan origins. She arrives in the middle of Lent, no less, and opens a chocolate shop. 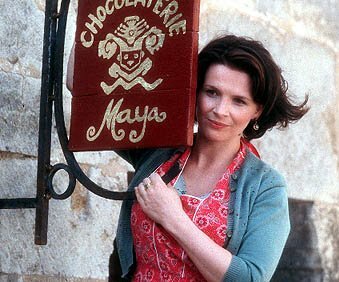 Chocolate is a metaphor in the film for forbidden passions, and soon the chocolate seller turns the town upside down with her free-spiritedness. She helps a physically abused wife to leave her husband and empower herself in feminist fashion. The mayor opposes her and attempts to reform the wife beater along traditional religious lines, also known as Christian repentance. His attempts fail, showing the inadequacy of Christianity to solve the problem. But the mayor continues on in his obsessive campaign against her and the “immoral” gypsies she keeps company with, until he can no longer hold back his own passions for the chocolate she wields. He finally gives in and consumes the brown stuff with Dionysian abandon, learning that so-called intolerance and old-time Christian religion are no match for the alleged “freedom” of feminist neopagan liberation (Brian Godawa, Hollywood Worldviews, pp. 125-126, cited without comment by Doug Wilson). So why watch such a movie with the congregation? Because there’s more to this movie than neopaganism. Like Babette’s Feast, it celebrates the goodness of God’s creation and the glory of human creativity. Both films remind us that food is more than just nutrition — good food, well made and served with love, nurtures both community and a proper sense of delight. The scenes in which Vianne stirs her chocolates on the stove are filmed with a delicious sensuality, and the feast given in Armande’s honor near the end of the film is warmly human and deeply inviting. Watching this movie ought to remind us that we aren’t gnostics and that food and the enjoyment of it isn’t sinful. The sooner we stop calling things “sinfully delicious” or referring to things that give us physical pleasure as “decadent,” the better off we’ll be. I enjoyed the movie on its own sweet level, while musing idly on the box-office prospects of a film in which the glowing, life-affirming local Christians prevailed over glowering, prejudiced, puritan and bitter Druid worshippers. That’ll be — as John Wayne once said– the day. I don’t care about box-office prospects, but shouldn’t this be the day, the day that Christians start becoming known for being joyful and life-affirming, for embracing all that is truly good and beautiful, for delighting in the pleasures of food? But I’m not persuaded that Ebert, Haack, and especially Godawa are correct. 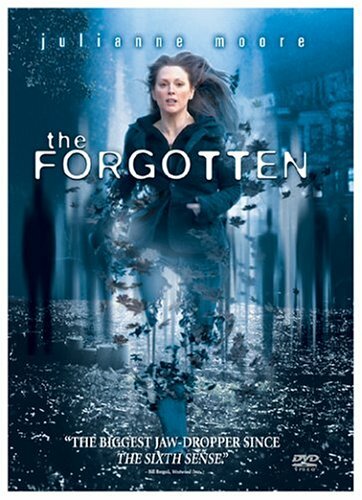 Is this really a movie about paganism triumphing over Christianity as Ebert thinks? Hardly. As for Godawa’s review, I don’t know if there are two sentences in it that are correct. Is neopaganism the driving force? Nope. Does the movie present “neopagan redemption”? Nope. Does chocolate represent forbidden passions? Nope. Is the movie about feminist empowerment? Nope. Are the mayor’s efforts to reform the wife-beater “Christian repentance”? Hardly. And on and on it goes. Now it’s true that Vianne is a pagan. She’s under the influence of the pagan gods, it seems, who drive her from place to place when the north wind blows. In particular, she seems bound to her mother, whose ashes she carries with her in an urn. There are Mayan statues in her chocolaterie. Vianne doesn’t go to church, and a small boy peeking through her window tells another, “I’ve heard that she’s an atheist. Furthermore, she plans a fertility festival for Easter Sunday. So certainly there’s more than a little paganism going on here. As Godawa says, and it’s about the only thing he gets right, Vianne opens a chocolaterie during Lent. Now I don’t know much about what Lent would be like in a Roman Catholic community in France in 1959, but it seems to me that a lot of people today, including those who give up pleasures for Lent, don’t really understand Lent either. Lent is about repentance in connection with Jesus’ death, not simply abstinence from things that give us pleasure. Lent begins on Ash Wednesday and runs for forty days, but if you count the days, you’ll find that there are more than forty days from Ash Wednesday to Easter Sunday. Why? Because there are a lot of Sundays in that period and Sunday is never a fast day. That’s what people seem not to understand. Sunday isn’t a fast day; it’s a feast day. And therefore I’d argue that if you’re fasting from something (chocolate, for instance) during Lent, you ought to be eating it on Sunday. Otherwise, you’re turning the feast day into a fast day. But in this small town somewhere in France, the whole of Lent is a time of abstinence from physical pleasures and certainly from chocolate. The abstinence is key to the moral fibre of the town, it appears, and that moral fibre is due largely to the influence, not to say the iron hand, of the mayor who even edits and later writes the new young priest’s sermons. Fascinatingly, as Doug Jones points out in one of the few good reviews by Christians I’ve seen (the other is by Jeffrey Overstreet), the mayor “puts the chocolatier in the same category as the Huguenots — a curious insertion, given that most moviegoers won’t know who Huguenots are.” The chocolatier, with her attitude toward the traditions of the city and her emphasis on love and joy, is being associated deliberately with the Huguenots, that is, with the Reformers. That’s worth thinking about. In the course of the movie, it does appear that Vianne brings new life to the community in various ways all of which can be summed up in terms of love and food. When a battered woman, Josephine, escapes from her husband, Vianne takes her in and teaches her to work in her kitchen. Contrary to Godawa, this isn’t “feminist empowerment.” It’s love. And that love, combined with and expressed in chocolate, is life-changing. The mayor, meanwhile, takes on the task of reforming Serge, the wife-beater. He forces him into the confessional. He requires him to attend catechism classes with the little boys. He trains him to eat with good manners. He makes him wear a suit. Are these changes “Christian repentance,” as Godawa suggests? Far from it. The man’s outward behavior changes, but his heart doesn’t. The law can’t change the heart, and neither can memorizing doctrine or going through the motions of repentance. 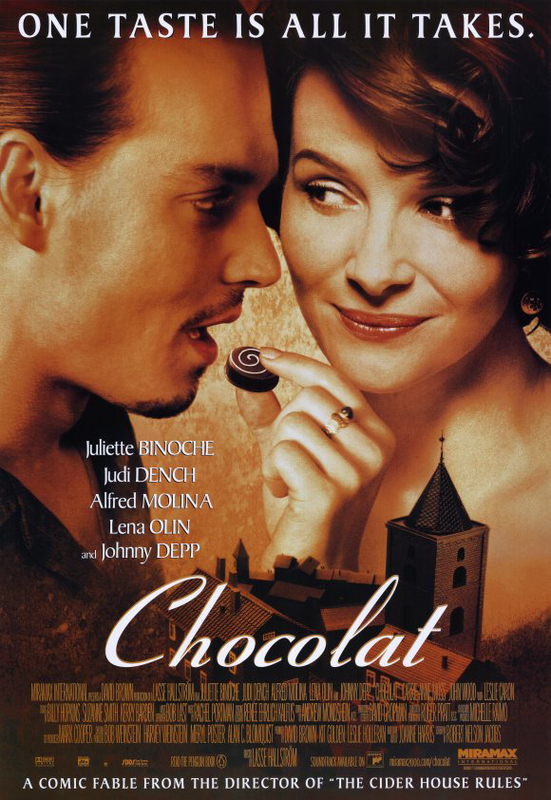 In a striking juxtaposition, the film shows the priest placing a thin wafer of bread in Serge’s mouth and then switches to Vianne’s daughter placing a chocolate cookie in Josephine’s mouth. Which has the power to change people? The chocolate, of course, but the change is due to the context of love and the failure of the host in the Mass to change Serge is due, not to “the inadequacy of Christianity,” as Godawa thinks, but to the inadequacy of the law. The law can’t change you, but love can. And when sin reaches its deepest point, the law, represented by the mayor, runs out of options and can only condemn and banish. But Josephine isn’t the only one to change. One way to get to the heart of a movie, I suggest, is to ask: Who changes? Godawa points to the change in Josephine and to the change in the mayor at the end of the movie. The priest also changes. But perhaps that’s not the best way to put it. All along, the priest has displayed an attitude which is different from that of the mayor. When we first see him, he’s singing “Hound Dog” and dancing, and when the mayor catches him in the act, he confesses that he has “a weakness for American music.” Later, when the mayor talks about how they ought to respond to the gypsies, the priest tries to talk about Jesus’ very different way of treating people. The priest is young and inexperienced and at first he’s dominated by the mayor, but the priest knows that Jesus’ teaching isn’t the mayor’s. The priest is not an enemy who will be conquered by neopaganism. But at the end, the priest succeeds in escaping from from under the thumb of the mayor and preaches his own sermon on Easter Sunday, a sermon in which he stresses the incarnation, the true humanity of Jesus. He says, too, that our goodness is not defined by what we abstain from and avoid but by what we embrace and who we include. And as we look around the church, we don’t find that all of Vianne’s friends have left the church to form a new community around her. We find them all there. True, Vianne isn’t there. But her associates are. This is a new church, appropriately so since it is Easter morning, the time of new birth. And the new birth is not, as the mayor suggested, the rebirth of our moral awareness. It’s the coming to life again of Jesus Christ, Jesus the man. The old gnostic legalism is replaced by love and by a delight in the goodness (and tastiness!) of God’s creation. And the chaotic paganism which prompted the crisis doesn’t triumph but rather is rejected. And while the former pagan and the rootless gypsy don’t join the church, they do choose to make this largely Christian community their home. And shouldn’t this be true of us: That we, as the church, are the ones who delight in chocolate, who love the pleasures of the bodies God gave us, who rejoice in God’s good creation, who welcome the strangers and shelter the hurting, who have the fulfillment of paganism’s longings, and who are known, not only and not primarily for what we reject but for what we love and embrace? Chocolat helped focus us on that goal, and so did the dark chocolate my wife supplied in abundance as we watched the movie. Watch it and enjoy it and let it stir your imagination as you think about how to live as the church in the world. Yesterday afternoon, Moriah’s mom watched Aletheia (thanks, Mom!) while Moriah and I went to Ashland to see Scoop, the latest film from Woody Allen.Â It’s a mystery-comedy, something Allen has done before, often in between more serious projects.Â It was clunky at times.Â Allen’s character was embarrassingly grating at times and Scarlett Johannsen, it seemed to me,Â didn’t always seemÂ to be able toÂ make her funny lines work.Â The ending, too, disappointed me. We realized that we haven’t been out to see a movie together since the day we got engaged (The Return of the King).Â Yesterday was fun and we’ll probably do that more often.Â Any movies out right now that you particularly recommend? My parents are here on vacation. My dad has been helping me get my books unpacked and my office set up, and my mom has been relaxing, playing with Aletheia and visiting some secondhand stores with Moriah. Yesterday afternoon, Dad and I went to see Superman Returns. In a word: It’s a dud. In what follows, there are some spoilers. We’re supposed to believe that Lex Luthor (who is never frightening) is going to create a new continent off the coast of North America, which will quickly shift the earth’s surface so that much of North America is either under water or is incorporated into the new continent. But the new continent, when we see the first stage of it, is entirely made of crystals. Nothing would grow on it, and so no one would live there, which means (contrary to Luther’s plans) that it’s worthless land. Furthermore, there were no surprises. Sure, the movie tried to give us surprises. A plane plummets toward the ground and disappears from view … and then, comes flying back into view, supposedly because the pilot finally managed to pull it out of its dive! Anyone seen that one before? Of course, you have. A man in the hospital is flatlining. He’s dead. Next scene: He’s in a coma. (Huh? How did that happen?) Someone comes to visit him. Does he wake up? No. (Ha! Fooled you!) But in the next scene, he’s alive again. Could you have predicted that? Of course you could. It’s one cliche after another. I also have to admit that huge catastrophes don’t particularly move me in films. Maybe that’s just me. I don’t find it particularly scary to watch earthquakes ripping apart the ocean floor or make builidngs fall down. I’m much more interested in smaller-scale dangers, I guess. I want to have a sense that the people that I care about (not just people in general) are in serious danger of being hurt by other people, not by somewhat impersonal catastrophes (even if they are launched by homicidal maniacs). But, as I said earlier, Lex Luther and his schemes were never remotely frightening. And, more significantly, at no point did I feel that one of the characters was really seriously in danger. In fact, there was only one character that I cared even marginally about. I found Superman thoroughly annoying, topped only by Jimmy. Lois Lane was hardly believable as a journalist or as a Mom (“How many f’s are there in catastrophe?” this Pulitzer Prize-winning journalist asks, apparently, I’m told, in continuity with the first movie, but still…). The only person I cared about was her (shack-up) fiancee, and mainly because I thought he cared for her more than Clark Kent/Superman did and I didn’t want the movie to kill him off or make him be the ultimate bad guy or otherwise separate him from Lois Lane so that she could be with Superman. I cared about him because I thought he seemed like a decent guy, a good dad, a loving “husband” and so forth, and I didn’t know if the movie would value that enough in the face of a possible affair between Lois and Superman. Toward the end, I almost fell asleep. Dull dull dull. Of course, some reviewers will tell you that there are all kinds of Christian symbolism in it. After all, one of the big questions the movie asks is “Does the world need a savior?” Superman hangs in space, hearing everyone’s cries for help. When Superman “dies,” he has his arms stretched out and his feet crossed in a cruciform position. That kind of stuff is almost certainly deliberate. But all of that is really the lamest and most obvious sort of quasi-Christian symbolism (“Let’s put in some Christian symbolism here”) and it certainly doesn’t redeem this movie. Where decency prevails, I let the wedding run its usual and rightful course and dance as much as I please (tanze immerhin). If you are decent and moderate in your conduct, you cannot dance or sit away faith and love. Youngsters certainly dance without harm. You may as well do likewise, and become a child; then dancing will not harm you (cited p. 136). Dances are arranged and permitted that courtesies in group life may be learned and friendships may be formed among adolescent youths and girls. For in this way moral conduct can be observed, and an opportunity is also given to come together in a decent manner so that in the light of this acquaintance with a girl a young man can thereafter more decently and deliberately court her…. But let all be done with modesty. For this reason decent men and matrons should be there to mingle with the dancers that everything may be done more fittingly. At times I myself shall be there so that my presence may keep them from the gyrations of certain dances (cited p. 137). 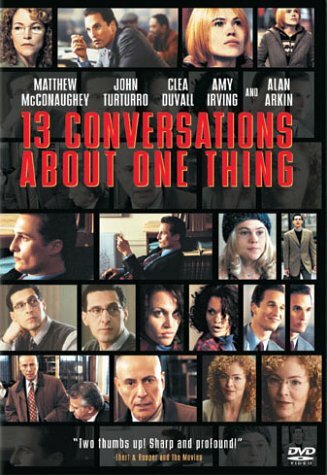 The other night, Moriah and I watched Thirteen Conversations About One Thing. It’s a thoughtful film, well written, nicely directed, and well worth your time. Moriah and I found ourselves discussing it several times over the next few days. The other day, Moriah and I watched The Village, the latest M. Night Shyamalan movie. We spent some time afterwards talking about it. It’s an interesting film, though not perhaps as convincing as some of his others. I was glad to read Peter Leithart‘s helpful and thoughtful comments on the movie. I, too, was wondering what exactly Shyamalan’s target was and what he was trying to say about it. At any rate, it’s an interesting movie and worth watching. On Thursday night, I watched The Deer Hunter for the third time. A USA: Friends sing together; wedding; hunting. The movie starts with a bunch of guys getting off work and driving to a bar, where they sing together (Frankie Valli’s “Can’t Take My Eyes OfF You”), as they prepare for Steve to get married and for Michael, Nick, and Steve to go to Vietnam. There’s also a very long wedding scene in the Orthodox church, which (I gather) bores some viewers but which I’ve always enjoyed. The music is glorious. Michael, however, appears to be stand-offish, the guy who doesn’t need anyone else, the guy who doesn’t fit well into the community and who makes it clear that he has little use for God or the church. Before leaving for Vietnam, Michael promises Nicky that he won’t leave him there. The men, except for Steve, all go on one last hunting trip together. Already at this point, we see some growth in Michael’s character. He originally says that he and Nick have to leave Steve behind because Steve is too badly wounded to survive, but in the end he gives up his own chance at safety to rescue him. C is the central section of the movie and it is the turning point. Michael has returned home, but Nick has gone AWOL and Michael has left him behind in Vietnam. The return home is awkward, but more than that, it is also a temptation. The temptation is to ignore his promise to Nick, to settle down with Linda, whom he loves but who is engaged to Nick, and to return to his old life. He tries. He even goes hunting again. One might object that, if this movie is indeed a chiasm, the hunting scene ought to have been at the end of the movie. That may be true, but by putting it here and breaking the perfection of the chiasm, the director has managed to present this first return as a false return. The USA-Vietnam-USA chiasm which makes up the first part of the movie isn’t complete. Michael’s hunting trip clinches things for him and he decides to return to Vietnam. In the next B section, then, Michael finds Nick and tries to persuade him to return. Nick has been playing Russian roulette for money and is so messed up that he can’t stop. At last, he does recognize Michael and he even quotes Michael’s old boast about deer hunting: “one shot.” But though Michael risks his life to save him, as he risked his life to save Steve, he can’t. In the end, there is another A section. This time, however, it isn’t a wedding we see but a funeral, again in the Orthodox church. The movie started with a bunch of rowdy guys singing together, but in the end it isn’t just a bunch of guys; it’s a community, men and women, and they’re singing “God Bless America.” Michael has learned self-sacrifice and now he is part of the community and can sing a prayer with humility instead of scorn. The structure thus contributes to the story. The first little chiasm (USA-Vietnam-USA) isn’t the full return; the deer hunting isn’t the same without Nicky and is a reminder of broken promises. The final return completes the big chiasm, though without the deer hunting now. Now, at last, Michael has become a true hero, one who lays down his life and his hopes for another, and now a new life can begin. There’s a lot more going on in the movie than this brief outline shows. For instance, I’ve said nothing about Stan, another key character. Every time I’ve watched it, I’ve noticed more in it to appreciate.